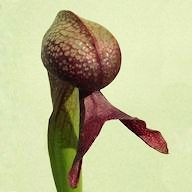 A short video update on the Darlingtonia house I erected this year. Growth has been pretty good so I had to remove plants from the edges of trays. This means I've now overflowed back to the greenhouses I thought I was making room in. Very beautiful. How many different clones of Darlingtonia do you have in there? Did I see an "Othello" in the corner? I think there are nine different clones in the video Jeff. There are actually two clones of Othello on show, one is the double tray in the corner as you correctly spotted. Othello is always trying to escape, I found six stolons trying to sneak into other trays last week. The main display is of my 1983 clone from which I had to remove thirteen half trays full of plants and they still don't look any different. A curse on anyone who says Darlingtonia is a slow grower.